After taking Graeme on a local stream a couple of weeks back it was Graemes turn to repay the favor as he took me to a stream closer to his home, we opted for a stream again to compare the rivers and i was very excited in trying out my new streamer and close quarter experience i had gained while being guided my John Tyzack the week previous. The heavy rain in the night almost put us off but after some deliberation we thought hell an hour won't hurt. After reaching the river we were greet by a beautiful overgrown run the river level was great and looked almost like the rain hadn't touched, but the only way down the embankment was through a old town house which was fenced off ready for demolition. We inspected the area but this was the only safe and sensible route down the embankment so out came the saw and we cut a few fastenings and pulled open the fence just enough to squeeze through, securing it behind us as we passed. Out came the streamers and within 2 casts i had a trout snap at my streamer. I cast again and snap, just pulling at the tail of it. I let Graeme take the hot-seat and within a couple of casts, wham he was in, but it wasn't a trout this time it was a nice little chub. Being out of season it was a quick snap a pic and release, no messing about but showing they are all warming up for the course open season in a few weeks. As we alternate after every fish caught or lost it was my turn and no more than 20 yards up i was in as well. Another chub, alot smaller but a fish none the less. After agreeing there were a few chub round here we walked further upstream to keep ahead of them. After going under a low bridge we fished a few sunken trees and Graeme had a chase of something meaty, i led the way through a minefield of brambles and nettles and saw a trout swim under my streamer then whack, something huge launches up from my feet and past my face. A fricking duck! I did jump to be fair! It was a female and with how quiet it had been, i pretty much was standing on it, we knew it must of been protecting something and sure enough under the fern at my feet, a little nest with several eggs in. We made haste upstream to allow the duck to come back as not to disturb it anymore. After a bit of walking i spotted a deep run cutting the inside bank and a quick cast gave me my first trout of the day, it pounced out from the undercut and was desperate to get back under but with Graeme at the net it was in. Not a huge fish but the first trout of the day. Graeme followed suit and on a nice bend he got caught in the process of repositioning the angle of his rod to pull the streamer parallel with the bank when a nice trout pounced on the fly and turned away. Though it wasn't long until Graeme made amends with a nice trout. Things quietened down after this much like the last time we was out together, we got a few chases and snatches but they wasn't hitting them with a ferocity. We had seen a few rises and alot of them would turn on the streamer but we wasn't catching and Graeme opted for a switch to a nymph. I was going to persevere for a little bit with the streamers and with the osmylids (giant lacewings) laying their eggs in the water, a few sporadic rises had begun to appear, which meant i did want to try a dry fly at one point. 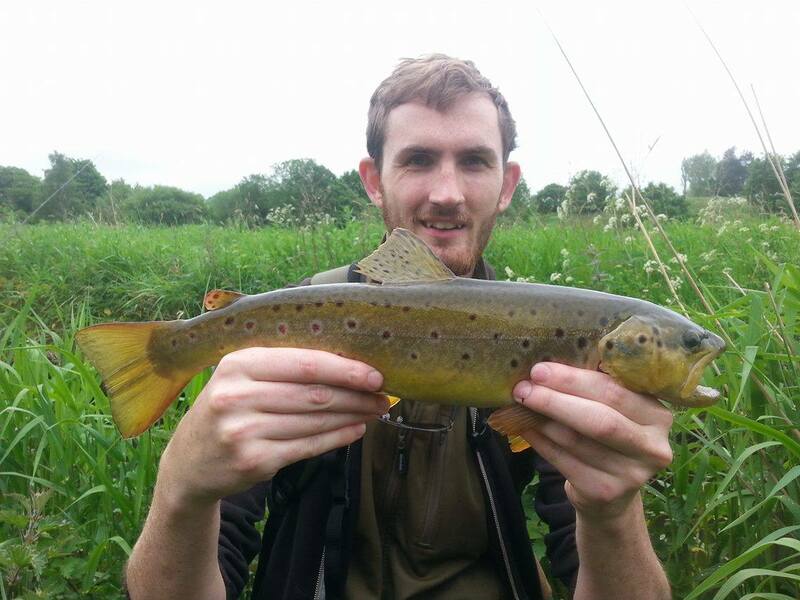 Within a couple of casts the nymph hit trout and ended the dry spell, it was a nice trout for Graeme keeping it's head down deep in the pool, he was on a 3wt so these trout really could have a go. Thankfully the pool didn't have any real snags so it mainly stayed deep and shook violently trying to throw the hook, but Graeme kept control and it eventually tired enough for a nice picture. I carried on with the streamer but the chases had stopped at this point so Graeme offered me his rod and as the fly went past an undercut there was a take, quite a gentle take but i struck and it was off, similar to Graemes it stayed deep but it wanted to go for a bit of a swim downstream, hugging the nearside bank i had to reach out to avoid snagging the foliage, a few close calls with some overgrowth left a large stick stuck to my line, Graeme nudged it off with his rod and the reel went off screeching, the trout didn't like that and raced off downstream taking line. I hit the brakes and fought it round a pool keeping it away from the edges the best i could as Graeme got in position to net it, it soon became apparent it was quite difficult to lift its head for a good netting chance so after a couple of attempts i managed to lift it and Graeme bagged it nicely. It was a beautiful male trout with a head like a fist and teeth like a pike it was one bony jawed trout worth catching. It was a good 2lber, well fed and a lovely golden colour. The long fight had tired it out but after a minute or so it's kicking became strong enough for a confident release and off it went back into the murk. We found some shallower water and were surprised to see some decent size fish in it so as we hadn't fished this run before we opted for a bit of 'spotting'. Basically the one who isn't fishing goes upstream a little keeping very still and stealthy and guides whoever is fishing to where the fish are holed up. After a few spooks and some competing trout Graemes longer casting soon paid dividends when he hit into a trout leaping out of the water, it did this 3 or 4 times before retreating into the reeds were it would find just enough slack to ping off the hook. 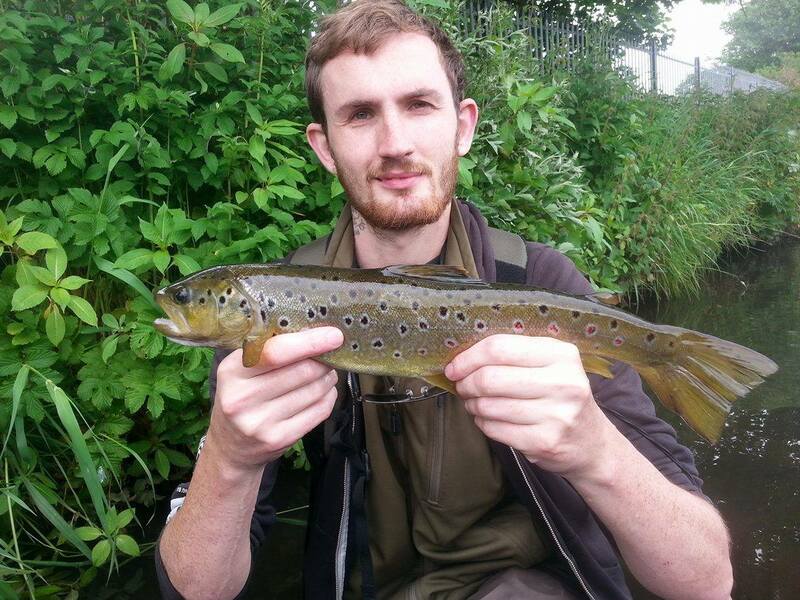 Walking upstream we saw an absolute monster of a trout as well as a nice trout and a little one. They were all cruising upstream but the nice one stopped and hid under a grassy verge. I dropped the nymph in front and it slowly came out in the direction of my fly, opened its mouth and turned back towards it's hole, i struck and it was on. It had simply sipped the nymph into its mouth ready for the next one. It was another nice trout but we was soon on the hunt for the bigger one we had seen. We found it about 30 metres upstream harassing a shoal of big chub and after a quick look at the nymph it didn't bother, it was sat in the back end of a bed of water iris so presentation was very difficult. 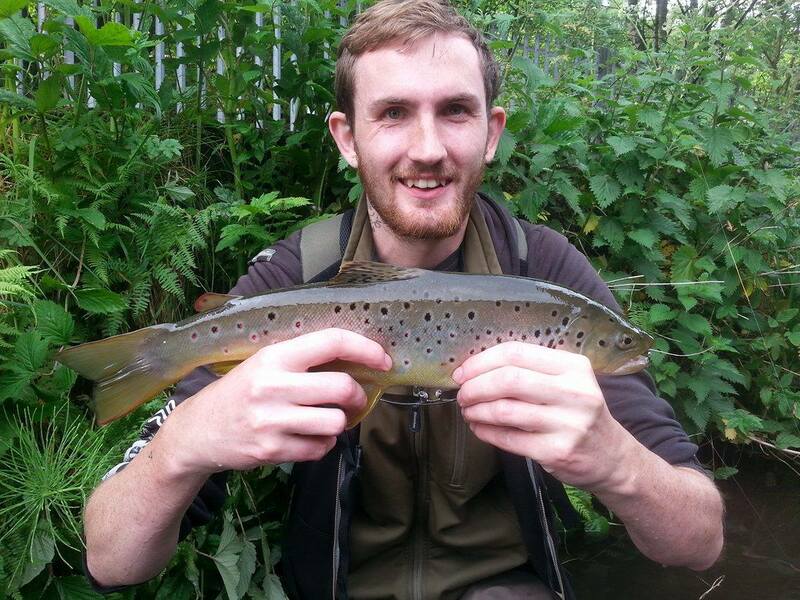 We moved on upstream to a spot i said looked good, first cast and Graeme was into a lovely trout. I climbed in as it really was forcing its way under the undercut by easily a foot. I positioned my net near the undercut to keep it from going under, being the nearside it was difficult to keep it out but it worked. It fought hard round the pool looking for all the nooks and crannies. After it decided to splash on the surface it got tangled slightly in the line on top and i didn't hesitate in netting it. It still had plenty of fight which made getting a picture a little tricky. My turn next and after seeing a small rise just ahead i cast my nymph to it when i felt a soft take i struck hard and i was on. It was a weird take as it literally stayed on the river bottom and swam straight downstream, i followed it downstream as the line built up with more twigs and leaves as it dragged me through the undercuts. It then ripped out a good few feet of line with a burst of speed but after it slowed at a shallow i managed to turn its head while Graeme got into position to net it. It tried a few tricks by aiming between Graemes legs but he reacted quickly and netted it. It would be our final fish of the day in what was a true change of tactics to what we initially planned for, but we adapted and it paid off. In total between us we had 2 chub, 2 perch, 3 roach and 10 trout. Both chub and perch took streamers while the roach took the nymph. We know now that if the fish dont take the stream with confidence it probably will be like that for the majority of the river. Funnily the past 2 trips i have gone with a method in mind and ended up on a different method which shows it is good to be able to switch between different methods on the fly.